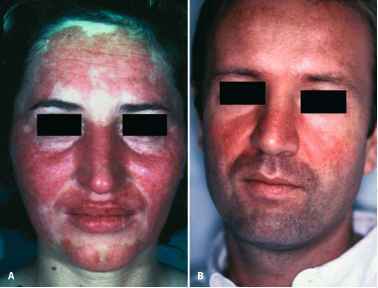 Anti-Ro/SSA antibodies are present in the serum of patients with SLE and Sjogren's syndrome and in 1 in 1,000 healthy people. The anti-Ro/SSA antibody is directed against ribonucleoproteins consisting of a 60-kDa peptide and an antigenically distinct 52-kDa polypeptide. Positive anti-Ro/SSA antibody has been seen in 4% of patients with CLE, whereas in patients with SLE the prevalence is 18%-30%, depending on whether immunoblotting or double diffusion methods are used. In a 1998 report by Chelbus et al. (Chelbus et al. 1998), there was similar frequency of both anti-Ro/SSA and anti-La/SSB in subacute cutaneous LE (SCLE) and SLE (approximately 70%). In another study, approximately 75% of patients with SCLE had anti-Ro/SSA precipitins (Sontheimer et al. 1982). Patients with SCLE have higher prevalence and titers of antibodies to both native 60-kDa Ro/SSA and 52-kDa Ro/SSA than those with chronic CLE (Lee et al. 1994).